Made an overnighter saturday night on the contender. We started out kinda late and got to our destination right about dark. First fish in the boat was a dolphin on a popper and that should have been a clue. We caught a couple more blackfin on jigs and poppers and started chunking and caught some dolphin. Ok well lets try livebaiting with flying fish and see what we can come up with. More dolphin. Ok lets try another rig and give it a shot. More dolphin. Hmm this tuna plan isnt working very well but the dolphin plan is going better then expected. I tell the guys to take a little nap while I move the boat 25 miles to another rig. I took it slow at 10 mph so they got a two and a half hour nap. We get to the other rig and voila no dolphin at least not yet so at least we could catch some big blackfins in the 20 pound range. Greg finally put the first yellow in the boat at about 50 pounds. Then the dolphin showed up. 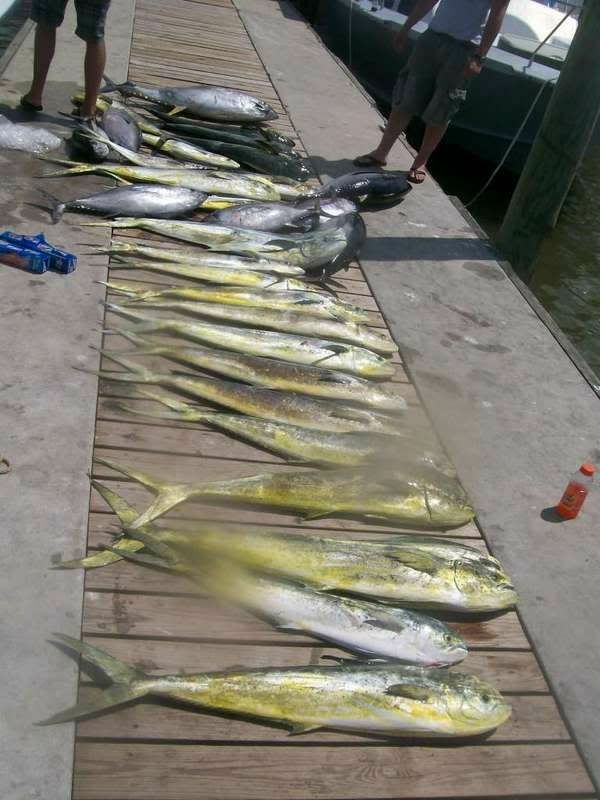 Between 4-6 am triple headers on dolphin were the norm. I even had one greyhound right into the boat. The fish ate a chunk and swam away then started jumping and ended up jumping over the engines and into the boat. Sure caught me offguard. Right at daylight Greg picked up about a 65 pound yellowfin on a chunk. At daylight I started dragging lures and caught you guessed it more dolphin. I started chunking while we were reeling a dolphin in and a whole school of cows showed up behind the boat. We caught a couple of them and gave it up with two yellowfin, six blackfin, and 22 dolphin.